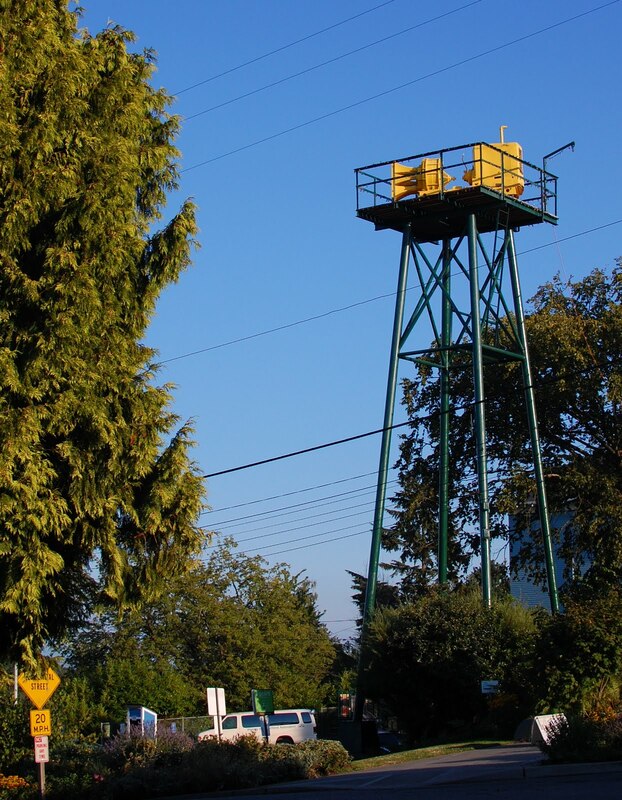 This is a Chrysler air raid siren, mounted on a tower in Phinney Ridge, and erected in 1953. The Chrysler is the loudest of the civil defense sirens. It was tested Wednesdays at noon, blasting 30,000 watts west-northwest. That's a 180hp Hemi V8 engine to the right, and a bank of six horns facing left. Sadly, it is no longer in working order. Seattle was one of several cities with these massive monster sirens. It didn't just blast west-northwest, the entire thing revolves on the platform! The V8 Hemi not only runs the chopper and rotates the siren via a gearbox, but also drives a huge blower in that drum behind the horns, which forces air through the chopper at high pressure! Seattle had seven of these, and two are confirmed to exist, the cosmetically-restored one on Phinney Ridge and an unrestored one at Northacres Park. The others are, or were: City Light building by I-5 (removed), Georgetown Steam Plant (removed), Police Garage downtown on Cherry (building razed), Washington Athletic Club roof (probably removed, can't seem to spot it on satellite images), and Columbia City (I'm hunting for this one!) Seattle also had a number of little electric sirens, all removed.